Welcome to the Client Testimonials section of our site. Here you will find actual client reactions upon first viewing our meticulously hand executed restorations of their family heirloom pieces using period fabrics and sewing methods. At Rocky Mountain Quilts we consider it a privilege to be entrusted with the care and restoration of treasured family quilts that will be passed to future generations. We also receive wonderful feedback from first time buyers as well as repeat clients who have purchased their treasure from the more than 450 antique quilts available online and in our York, Maine gallery. 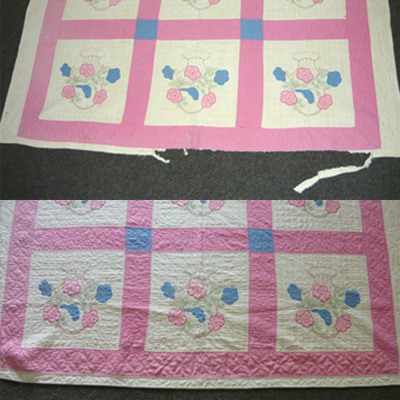 "Hi Betsey, Wanted to let you know that the quilt arrived safely, and it is beautiful. It's amazing to think that this is what it would have looked like a hundred years ago, and now that it's cleaned and restored, that it'll look this way for the next generations in the family, too. We've been sending pictures to C's family, and everyone is stunned -- in a good way. Thanks so much" - R.B. & C.B. "Hi Betsey, I received the quilt and all I can say is "wow"! The work you did on it is stunning, and I am overjoyed at the end result. I just cannot believe the transformation ... it looks better than new! 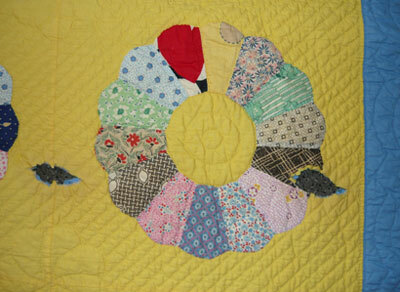 The quilt had originally belonged to my Great Grandmother, and is very sentimental to me. Now, it is ready for the next seventy five years! Thank you so much and have a Merry Christmas." - D.W.
"Dear Betsey, My childhood quilt is beautiful, and I am so pleased that I can now pass it on to my Granddaughter in pristine condition! Thank you for the wonderful work you do. My best, P."
" The quilt made it safely to San Francisco! It looks gorgeous. Thank you for bringing it back to life. I will be sure to sew the information you gave me about the quilt and what I can learn from my mother onto the back. " - K.B.
" We received our quilt this week. It looks great. Thank you so much for getting this treasured memory ready for our daughter! " - S.T. "We can't tell you how delighted we are with the restoration of our handmade quilt. It looks just like it did the day I finished it many years ago. We have missed the quilt while it was being restored, but now that we have it back it is like having a family member back again. 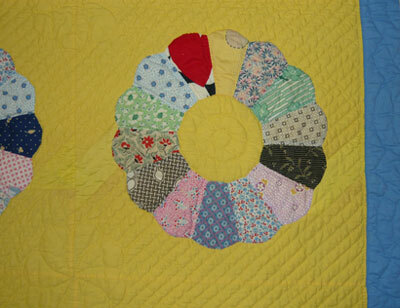 Thank you and please extend our thanks to all the hands that gave our quilt new life." - SML&JLL, Stratham, N.H.
"Dear Betsey, I received my grandmother's crazy quilt this afternoon--it is absolutely stunning! It is so bright and looks brand-new again. My special thanks to the restorer who accomplished my many detailed wishes for bringing the quilt back to life. I also appreciate having the excess materials back. I thank you very much for the time, attention, effort, and the ultimate result you gave me." - J.P., CO.